TLCD employees manned the bar and served beer while Starmont Winery poured vino to our guests who enjoyed small bites from Chloe’s while perusing our new home. The open office layout really lends itself to large gatherings especially when the garage door is open, connecting our large conference room to the rest of the space. We had about 300 guests join us during the three-hour event, which gave us a chance to get a lot of feedback about our design. We invited guests to share their thoughts on the wall in our “Gumby” conference room that doubles as a white board. As we anticipated, everyone had positive things to say about our new office and thought it felt like a great place to work. We are grateful for all of the effort that went into designing and creating our space and definitely enjoy coming to work here everyday! Thank you to everyone who came to celebrate with us, and if you missed the event – please feel free to stop by next time you’re in downtown! For more pictures from our Open House, check out our Facebook page! Guests shared what they thought of our new digs! Santa Rosa’s city center has long been known as Courthouse Square and it carries a long, rich history. Originally laid out as a plaza in the early 1800’s, it later became the site of a grand County Courthouse. The Square was a lively center of community and political activity and a place where young and old gathered. The 1906 earthquake destroyed the Courthouse and a new one was built on the same site as part of the reconstruction efforts. By the 1960’s county government had outgrown the Courthouse and it was razed. In the midst of urban renewal, the Square was divided into two parts by varying interests and Mendocino Avenue was routed through the middle. Several decades and many City Councils later, the City of Santa Rosa is moving forward with the Reunification of Courthouse Square. This plan reunifies the Square and creates an urban park and gathering space for residents and visitors alike. With proximity to great dining, shopping and events like the Wednesday Night Farmers Market, it will also serve as an economic boon to local businesses. TLCD Architecture has been a downtown Santa Rosa business for over 50 years and the architect on many key public projects. In February 2016, the firm moved to our new office at 520 Third Street, which fronts Courthouse Square. The building, a former telephone switching facility, had been abandoned for decades. TLCD’s team recognized the potential to transform it into a contemporary building with urban office space and retail opportunities. Working as part of the development team, this building was designed with the reunification of Courthouse Square in mind as a way to reinvigorate the city center. Recognized for our role in the revitalization of downtown Santa Rosa, as well as other community projects, the Santa Rosa Chamber of Commerce recently named TLCD Architecture Small Business of the Year. Principal Don Tomasi, accepted the award and spoke to our firm’s commitment and work culture. Furthering this exciting momentum are key infrastructure projects including the SMART Train, which is set to begin passenger rail service in late 2016. With stations that include the Sonoma County Airport (also in active expansion mode) and Railroad Square, there will be non-vehicular transportation directly to downtown Santa Rosa. This connectivity will bring a new level of energy and activity to the city center… aka Courthouse Square! To learn about the City of Santa Rosa’s vision, see the Downtown Station Area Specific Plan. For more about the history of Courthouse Square, read Gaye LeBaron’s article: Old Courthouse Square has divided Santa Rosa for 160 years. Check out our Chair Parade video here. As the TLCD Architecture designed American AgCredit Headquarters project nears completion, one of the most exciting details of the project is being installed – the main reception desk. Set in front of a rammed earth wall, this dramatic, 27-foot long monolithic white desk stands in striking contrast to the earthen wall behind it. The desk is manufactured in modules by Isomi in England, and is being installed by a crew from Connecticut. The crew glues the modules together, which are pulled tight by means of a motorized clamping system. The seams are filled and sanded, and the resulting monolithic structure is quite simply stunning. LED lighting will be installed at the base of the desk so that it will appear to float above the floor. Motorized clamping systems pulls the Isomi desk together. Who’s Up for a Field Trip… to American AgCredit? Architecture firms are all about field trips… and often they are tours of our projects under construction. 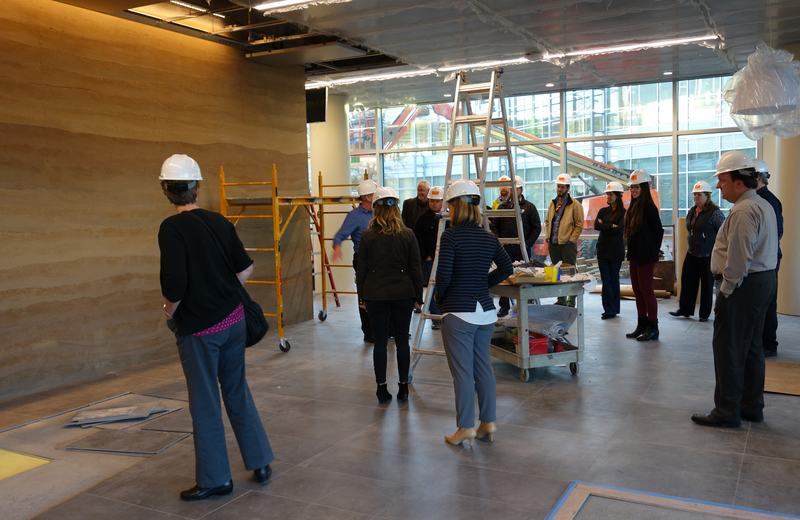 This week, TLCD’s staff got out for a tour of the American AgCredit Headquarters project in Santa Rosa. This landmark 120,000 square foot project is nearing completion with portions of the building to be occupied within a few weeks. It was a great opportunity to tour it and see how many of the key features are taking shape. In the photo above, our team is looking at the rammed earth feature wall which was built early in construction. It was encased in a wooden structure for protection, and then the building was constructed around it. The wall is a stunning reference to the soil that makes agriculture possible and supports American AgCredit’s mission of farm lending. One of many exciting design elements will be perforated zinc exterior cladding, which is only now beginning to be installed. Over the next few months these zinc panels will completely transform the appearance of the building. Not only will they visually define the facade, the panels will also provide sunshading that will significantly reduce the cost of cooling the building. On the second floor, we walked one of the sky bridges with a feature wall of channel glass. From the outside, the glass provides a distinctive entry element, but from the inside, it creates wonderful, diffused lighting for what will be a casual work area for the employees of American AgCredit. 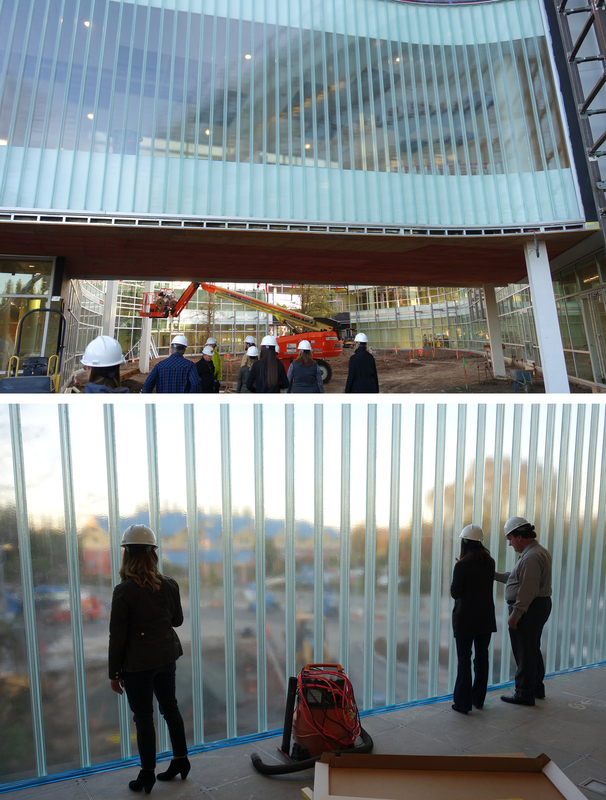 This sky bridge will have soft lighting to one side and clear views to the inner courtyard on the other side. Throughout the tour we did what most architects do… looked up, looked down, looked all around. These tours are a learning process for the entire staff and also expose us to ideas, materials and solutions we can use on other projects. Anyone living in California knows the impact the wine industry has on our economy. California produces 90% of the wine for the US with an estimated retail value of $24.6 billion. California is also becoming the leader in wine business education for professionals worldwide. What you might not know is that Sonoma State University in Rohnert Park, is leading the way with its innovative Wine Business Institute (WBI). The WBI is an education and research institute within the School of Business and Economics. It was created as a public-private partnership with a clear mission: to educate students, provide research and develop programs that would support the needs of one of the primary industries and employers in our region and around the world. WBI is the first and only program in the US to focus exclusively on the business aspects of the wine industry, offering both an undergraduate degree and MBA program. TLCD Architecture, located just minutes from Sonoma State University, has a diverse practice that includes work for both winery/hospitality and educational clients. 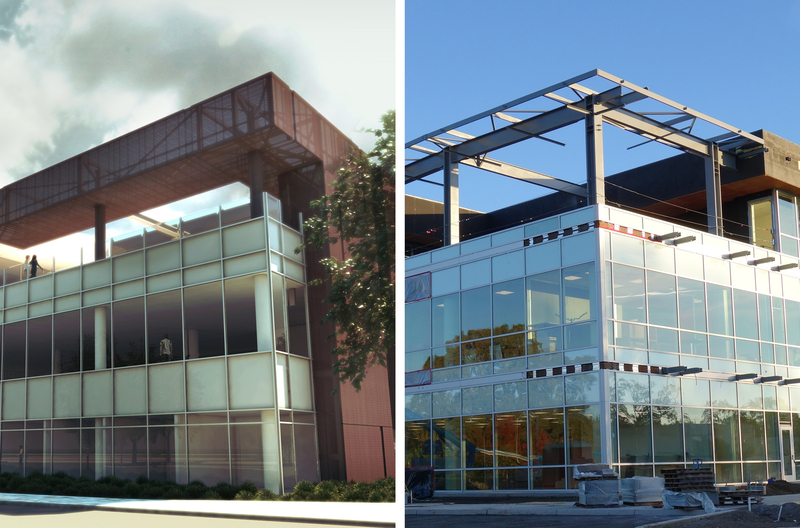 These two areas of expertise meshed beautifully when TLCD was selected to design the new Wine Spectator Learning Center at Sonoma State. It’s given us an opportunity to explore the programmatic needs of wine business and marketing majors and assist the school in developing high level design visualizations for fundraising efforts. Our work with the WBI began by meeting with the administrators and faculty to develop a vision and concept for the new facility, which will comprise a complete remodel of the original University Commons Building. 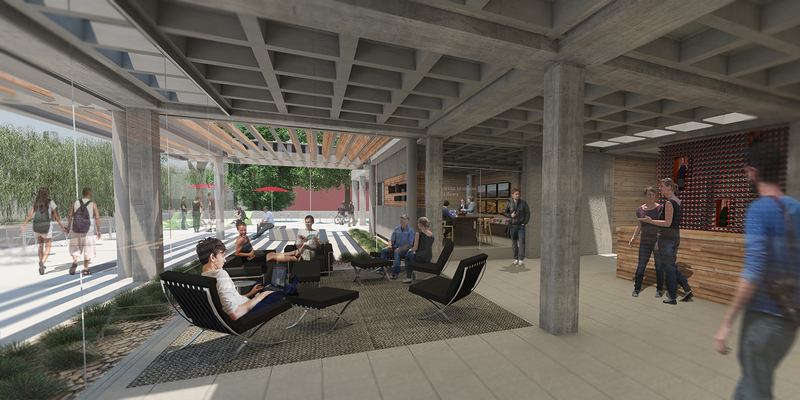 From that initial vision we created several renderings of the design concept, which in turn helped to generate several large donations for the project from the Institute’s partners in the wine industry. Schematic Design has been completed, and we’ll be moving into the next phases of design shortly. We’re fortunate to have Summit Engineering on our team, who also happens to be one of the premier winery engineers in Northern California. It’s incredibly fulfilling to be part of a program that will educate and train the next generation of wine business professionals and entrepreneurs. While TLCD Architecture’s work extends throughout Northern California, we have been in business here in Sonoma County for 50 years. Contributing to our community, quality education and a thriving business culture is important to us. Wine education is not all about classes, research and training. It’s also about immersing ourselves in the culture of wine and having some “serious fun.” We recently teamed with our friends at Summit Engineering for a showdown at the Sonoma County Harvest Fair “World Championship Grape Stomp” competition. Celebrating its 41st year, the Harvest Fair celebrates Sonoma County’s harvest by honoring world-class wine, beer and culinary creations. 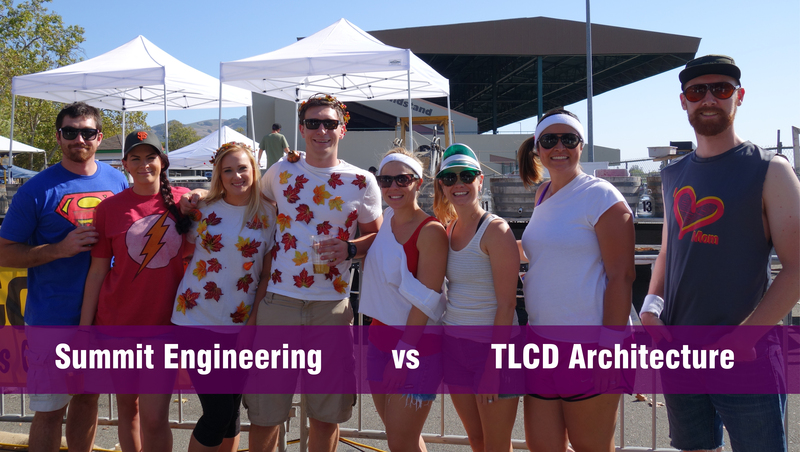 Click the video below to see the TLCD Architecture/Summit Engineering Grape Stomp Showdown! On a warm fall weekend in wine country, the ultimate grape showdown took place between two Santa Rosa firms. TLCD Architecture challenged Summit Engineering to compete in the annual Harvest Fair Grape Stomp for bragging rights about who can generate the most juice in under 3 minutes. Two teams from each firm prepared for this event by enduring a rigorous training regiment… mainly developing our core strength from laughing so hard. It turns out there is a real finesse to grape stomping as we learned the intricacies of being the “Stomper” or the “Swabby.” Foot size does not matter if you are the Stomper, it’s much more about the swirl and kick technique to move the juice towards the spout. The Swabby role benefitted from laser sharp focus and unusually long arms to funnel the grape juice into the jug. While the teams from TLCD and Summit did not win the heat that day, we had a respectable amount of “wine juice weight” and went home proud. Purple feet and hands, a trophy t-shirt and the following video mark this historic showdown.